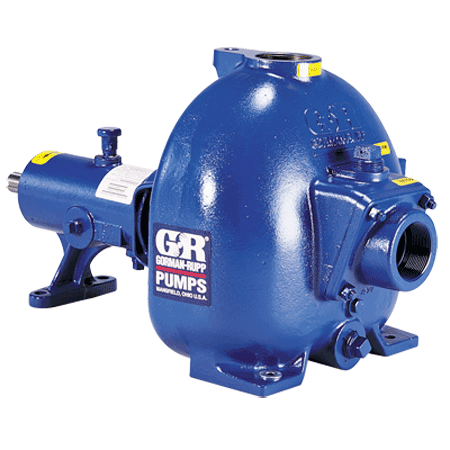 Gorman-Rupp 80 Series® medium head, mild solids-handling, self-priming centrifugal pumps are designed for non-stop work loads. The straight-in-suction design of these high efficiency pumps guarantees quick positive priming and allows them to operate at higher suction levels than most other self-priming centrifugal pumps. The liquid being pumped enters directly into the eye of the impeller, and a suction check valve prevents in-line return flow when the pump is shut off. And, because they have few moving parts, 80 Series pumps are easy to maintain and service, saving money in the long run. 80 Series® self-priming centrifugal pumps are available in a variety of configurations for all of your industrial, construction, mining, agricultural, municipal and petroleum fluidhandling needs. Exclusive 80 Series pump design provides higher suction lift, increased efficiency and allows pumps to operate at higher suction lifts than most other self-priming centrifugal pumps. 80 Series pumps are available with single and double seal options, grease, oil, and self-lubricated designs, depending on pump application. Carbon/ni-resist, carbon/ceramic, sintered bronze/steel, silicon carbide, and tungsten carbide seal faces. Fluorocarbon, Buna, and PTFE elastomers. Multi-vane open impeller is designed for high efficient. Impeller will handle up to 2 3/8" (60 mm) solids, depending on pump model. Replaceable wearplate provides maximum operating efficiency at all times. No expensive castings to replace. Extra-thick construction for life. 80 Series pumps are available as basic units for connection to customers' power source or may be flex coupled, close coupled, or V-belt driven by an electric motor. Pumps can also be powered by gasoline or diesel engines.